We built our home a few years ago and while we love the layout-so functional for our family, it lacks a bit of character. I've tried to inject a bit of history and warmth into it with things I love. Some of our vintage/retro treasures have been thrifted, some have been gifted and many are family treasures from days gone by-the very best kind, I think. Today I'm linking in with the lovely ladies at Lucy Violet Vintage and Hung up on Retro. I'm giving a little show n tell of a thrifted cupboard in our living area. I first introduced this little piece way back here. My milkglass collection has certainly grown since then. And my less is more approach seems to have been thrown out the window. 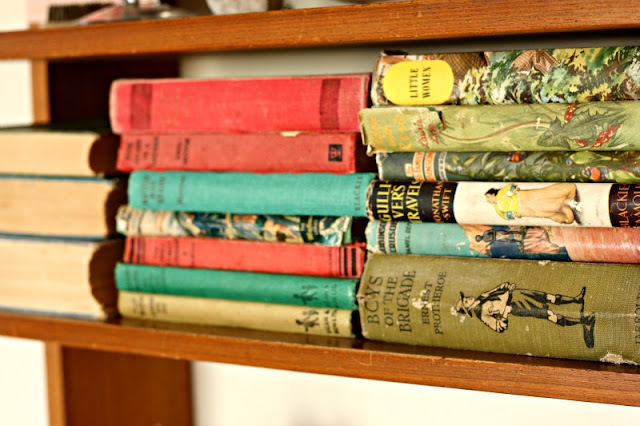 Most of the books belonged to my father-in-law when he was a boy. He assures me he wouldn't have read any of them. Some have been picked up at vintage markets and oppies. 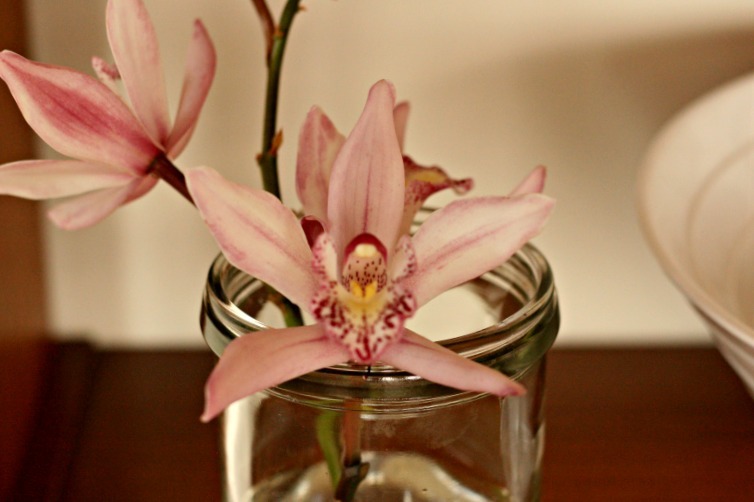 The Fowler jar become vase is one of many that I have collected. The milk glass beer mugs/coffee cups-whatever takes your fancy- were gifted to us on my inlaws 50th wedding anniversary. They were given to them as a wedding gift. The remaining milkglass has been collected at various swap meets and op shops. And inside...the four coffee cups were thrifted through the week. They are fast becoming a new favourite! And finally another favourite thing...this ironing board belonged to the Mr's grandmother. She is soon to be 100 years old! There's a long story about this for another time. I absolutely have nowhere to put this in our home but I love it so much! I keep shuffling it around and just haven't found it's spot yet. For now though, it is a great place to put the cushions at bedtime or hang clothes that I can squeeze another wear out of. My wearing the same jeans all week counteracts the three outfit changes my daughter makes most days! Well off the make that bed! Be sure to check out the other links...lots of lovely to look at. PS Happy Mothers Day to the mama's. You have some wonderful pieces on your wall unit. I especially love the ribbed bowl. I love the orchid plonked ever so stylishly in the old Fowlers, and those coloured tea cups with the white handles, I love your Orla Kiely linen, the old books - everything! I too have a cupboard just like this on my wish list. Such a versatile piece with all those little nooks for displaying treasures. 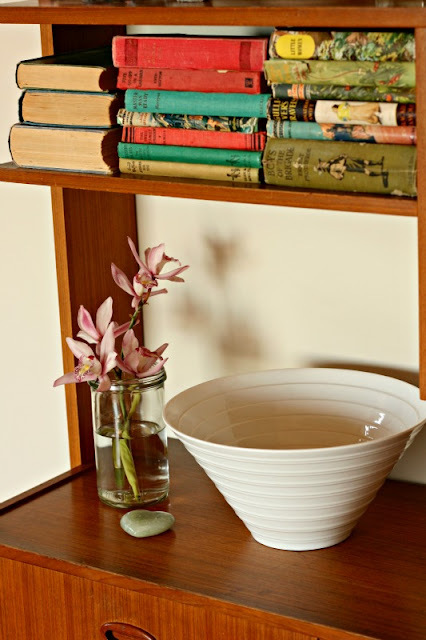 of course I love the milk glass which nicely contrasts with the timber. As to the ironing board I dream of one day finding one. I've seen them used as hall tables, perfect as they're narrow. Only a little joke, you know. 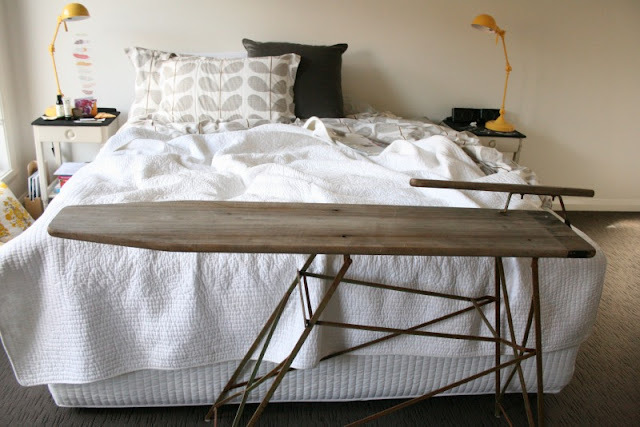 Your old Iron Bead is great but, i love the yellow lamp at your bed consoles ind the background. We use similar in black, but in yellow their are perfect. You have some lovely things - a lot of them very reminiscent of my childhood. Funnily enough what I like the most are the tea cups and saucers in different colours - I think they are gorgeous! 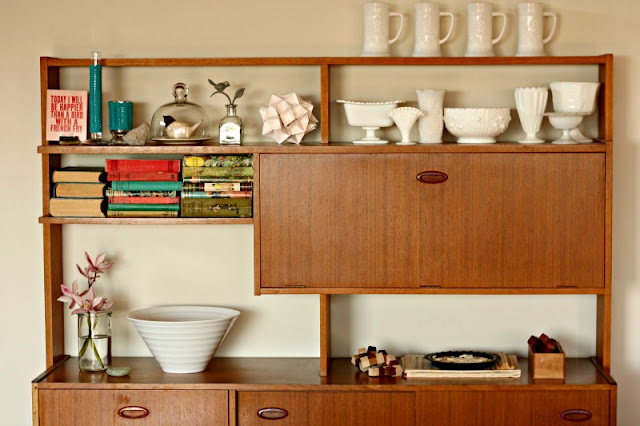 Love your retro sideboard! 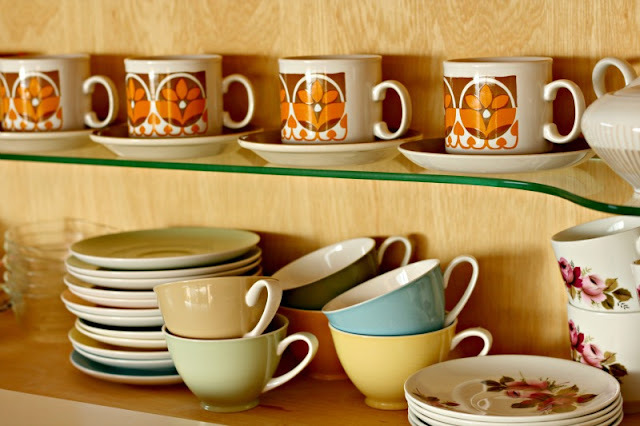 and those coffee cups are gorgeous! Love the ironing board! Leave it there, it looks great! Love that side board and I love how youve styled it. 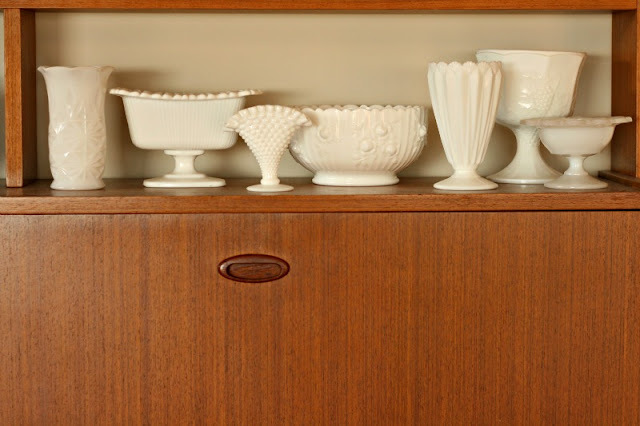 What a gorgeous milk glass collection. You still have the origami ball there! LOL. Thank you for your lovely comments on my home tours over on my blog! I hope to have some more very soon. Your home is just lovely also! Turns out I have been following your blog for a while, I must always miss the updates though. so much lovely in this post. staffordshire potteries always win my heart, these are real beauties.